The LED Array (8x7) is a set of 56 LEDs arranged in a nice 8x7 grid. 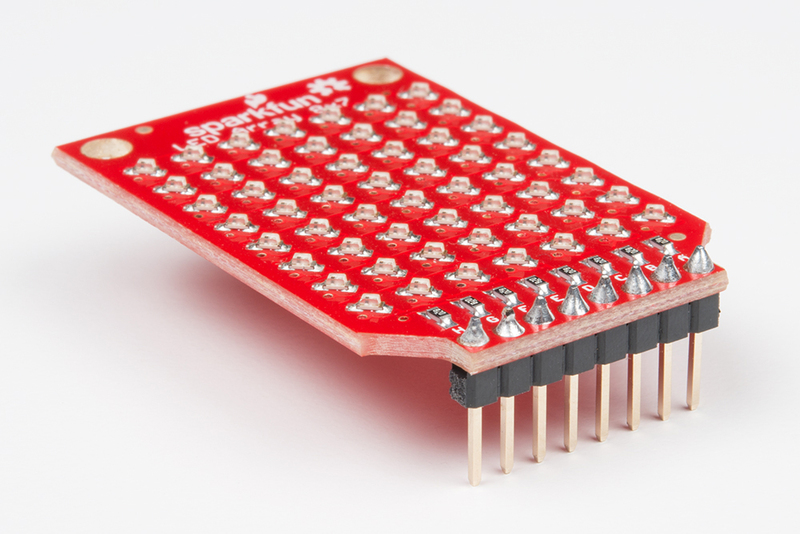 It relies on Charlieplexing to control individual LEDs, which means less GPIO pins are used (as opposed to a traditional grid format). 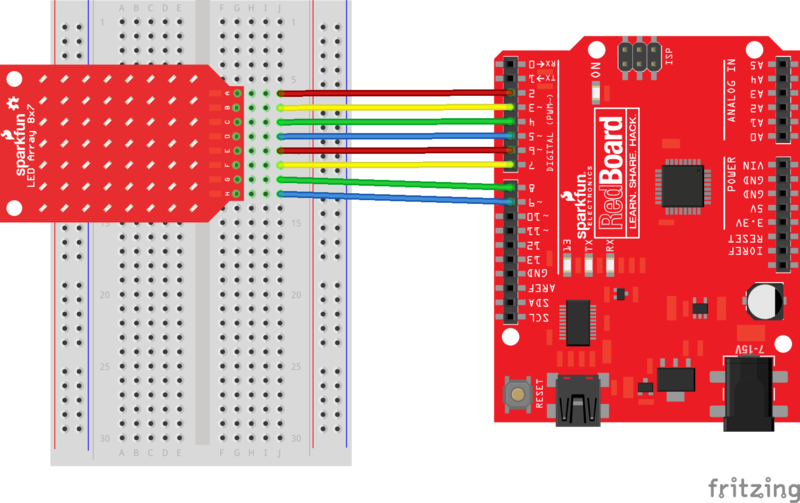 This guide will walk you through connecting the LED array and using some code examples to make those LEDs light up. We even wrote a library to help you display some simple graphics and scrolling text! IMPORTANT: For the time being, the library for this board only supports ATmega 168 and 328-based Arduinos (e.g. UNO, RedBoard, Pro, Pro Mini, etc.). You can still use the LED Array board with other platforms, just not the library. If any of these subjects sound unfamiliar, considering reading the following tutorials before continuing on. 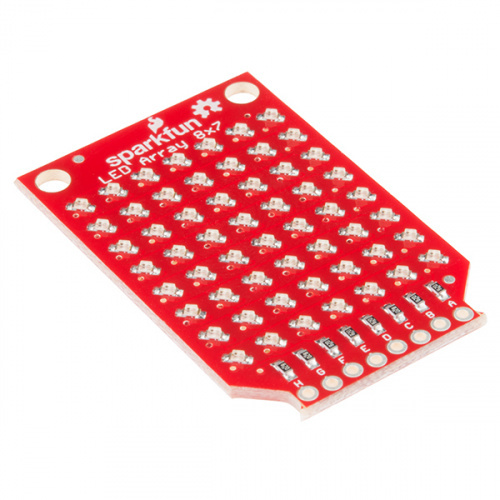 To understand how the LED Array (8x7) works, we need to first learn a little about Charlieplexing. The name came from Charlie Allen at Maxim Integrated, who proposed the solution in 1995 for controlling multiple LEDs with less pins from a microcontroller. The technique relies on using the ability for microcontroller pins to enter into a high impedance state (tri-state) and thus prevent current from entering or leaving that pin. Let's take a 3-pin example. With Charlieplexing, we can have 6 LEDs attached to 3 pins: n x (n - 1) = 3 x (3 - 1) = 6. We need to use the microcontroller's ability to tri-state pins to make this work. If we make pin 1 an output and high, pin 2 output and low, and pin 3 high impedance ("Hi-Z"), then D1 will light up. If we switch it and make pin 2 high and pin 1 low, then D3 will light up. And if we make pin 3 high, pin 2 low, and pin 1 Hi-Z, D6 will light up. This works because we can make the unused pins high impedance from the microcontroller. High impedance mode looks like an open circuit, so current does not flow into or out from the Hi-Z pins. If we cycle through all 6 permutations quickly enough, we can trick our eyes into thinking that all the LEDs are on. If we leave selected LEDs off, we can create simple images with our LED array! 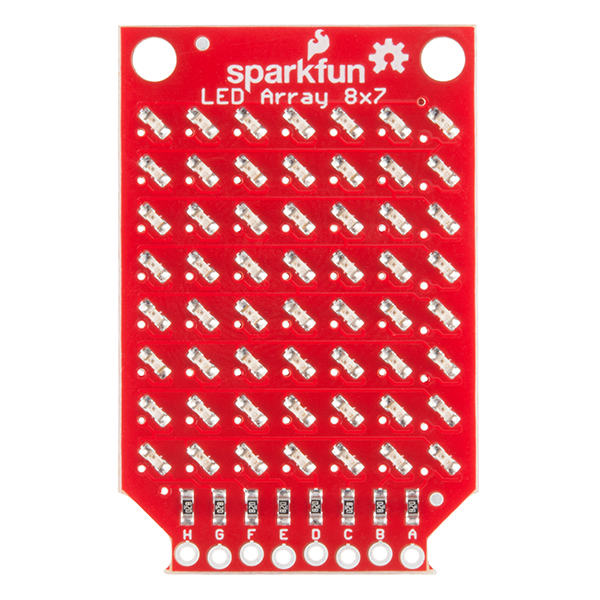 The 8x7 LED array takes our 6-LED example and expands it out to 56 LEDs and 8 pins. We can cycle through all 56 permutations of the pins to turn each LED on individually, and if we cycle fast enough, we can create simple images and text (at least according to our eyes). Now that we have the LED Array connected to our Arduino, we can run a simple test to make sure it is working. This example doesn't require any additional libraries. Simply plug the shield into your Arduino, and upload the example code. 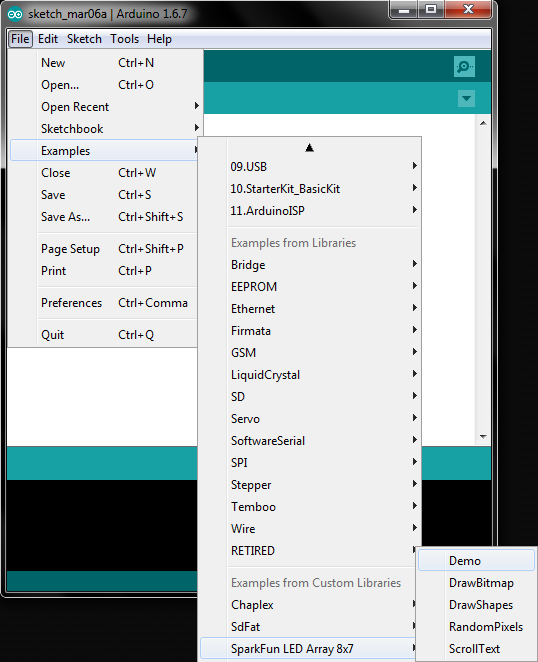 Should you want to read how to install the libraries manually with Arduino, skip to the next section. * Scrolls "Hello world" across the Badger's LED array. 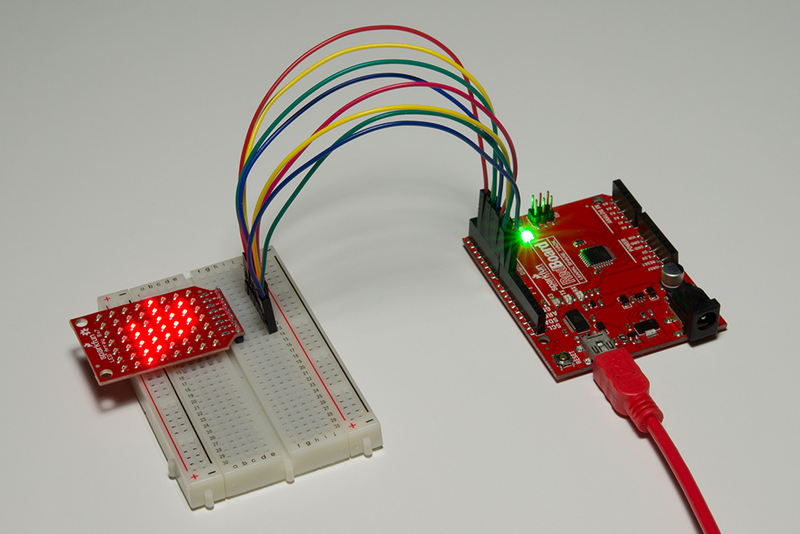 Your LED Array should scroll "Hello World." Once you have both libraries downloaded, follow this guide to install them in Arduino. Open the Arduino IDE, and select File > Examples > SparkFun LED Array 8x7 > Demo. 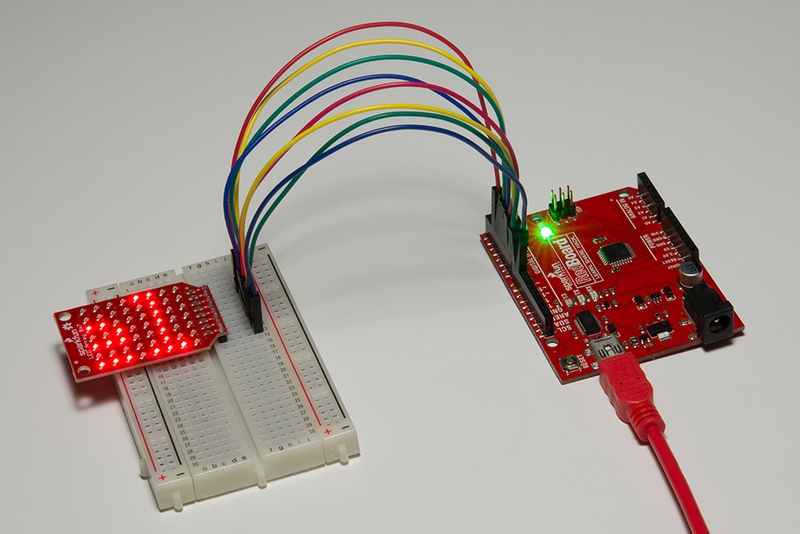 Select your Arduino and serial port, and upload the program. You should see the LED array scroll through some example text and graphics.